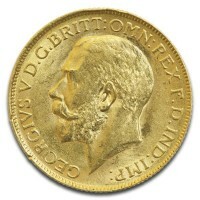 Get all four bullion metals in one product!!! 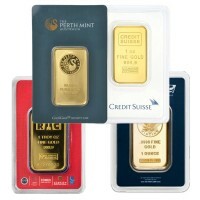 Money Metals Exchange is proud to offer gold, platinum, palladium and pure silver bars in the handy Multigram Portfolio. 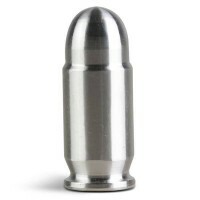 Each pack contains 4 bars of each metal in the barter-ready 2.5 gram size. 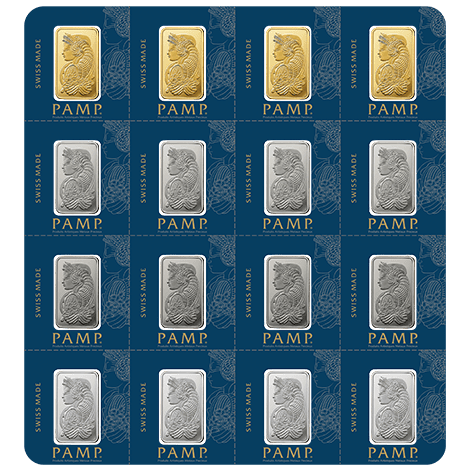 The package is designed to be separated into 16 individual sections, each containing a bar and marked with the PAMP name, serial #, weight and purity. This brand new portfolio is available through our direct relationship with the renowned PAMP Suisse company. 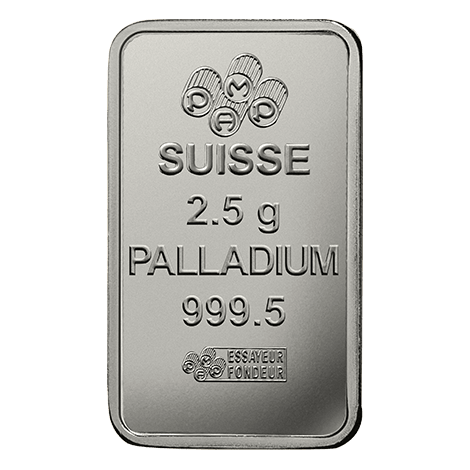 This Switzerland refinery is perhaps the premier name in bullion bar manufacturers. Easily recognizable by the Lady Fortuna design in the front of each bar, PAMP Suisse’s bars are classy and popular. The size of the 2.5-gram PAMP Suisse bar makes this product an easy way to invest in a selection of all 4 precious metals at an affordable price point. If you have already started investing small, like the Pamp Suisse silver bar, don't hesitate getting every metal. 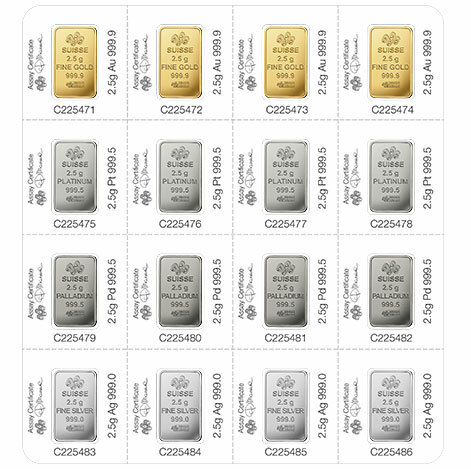 Get the beautiful design of the Pamp Suisse Lady Fortuna on bullion bars in palladium, platium, gold and silver today! A tamper-evident assay card to guarantee weight and purity. PAMP’s exclusive Veriscan® technology uses microscopic topography to identify products in their database. Each bar is scanned when manufactured and can be re-scanned later to verify that the bar is genuine. 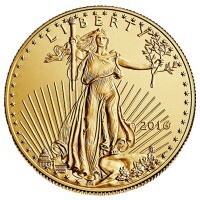 Contains qty 4 each 2.5 gram bars in .9999 fine gold, .9995 fine platinum, .9995 fine palladium, and .999 fine silver bullion. 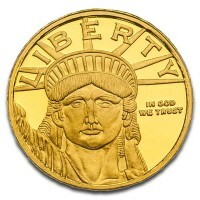 IRA approval – PAMP Suisse Bars are eligible to be held inside precious metal IRAs. The front of each bar features Lady Fortuna, a Roman goddess representing fortune and luck. PAMP Suisse bars are famous for their beautiful designs. These bars are famously recognized for the design of the Roman goddess. This design is one that you won’t find at another refinery. In this design, the goddess is blindfolded with hands outstretched to collect a bounty of riches flowing forth from the cornucopia that sits atop her head. The reverse side of each bar features the PAMP logo, bar weight, purity level, the assay mark, and an individual serial number. 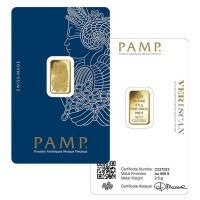 Buy PAMP Suisse gold bullion bars when you want the ultimate in trust and recognizability. All new PAMP Suisse Fortuna Gold Bars carry the mint’s proprietary Veriscan® technology to assure holders that the bars are genuine and untampered. The microscopic topography of each bar allows PAMP Suisse to assign an identity as unique as a human fingerprint. Bars can be scanned again later for verification. The PAMP Suisse headquarters are located in Ticino, Switzerland. The firm has risen to become one of the most respected refiners in the world. The Fortuna design is unique to PAMP Suisse products. To add a little flare to your holding, consider investing in PAMP Suisse’s Multigram Portfolio courtesy of Money Metals Exchange.